It throws a new one at you. This time its “tracheal stenosis”, or more specifically in my case, “posterior glottic stenosis “, which is basically a narrowing of the windpipe due to inflammation or the build up of scar tissue between or around the vocal cords. This scar tissue can impede the vocal cords from opening up all the way, effectively making the airway diameter smaller and more difficult to breath through. Though a pretty rare condition, the most common cause for glottic stenosis, is frequent and/or prolonged endotracheal intubation. And guess who fits that bill? 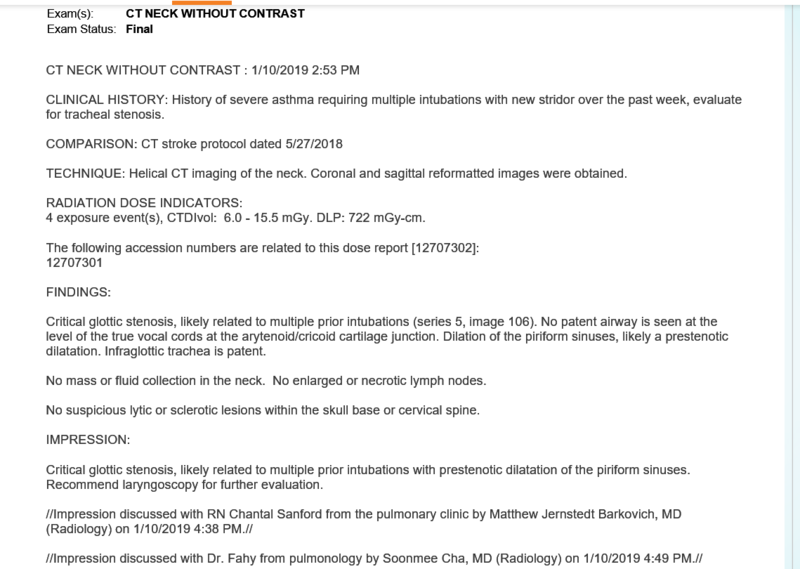 Talk about scary… nothing says you’re gonna need a tracheostomy like tracheal stenosis does. Here’s the back story leading to my diagnosis and the miraculous treatment that saved me from needing a hole in my neck, at least for now. This blog post is dedicated to the highly skilled and caring physicians and surgeons at the Departments of Radiology and Otolaryngology at UCSF. Thinking back on it now, the condition was probably a long time in the making, but the noticable symptoms didn’t surface until just recently. I think the first hint that something wasn’t quite right was that I never fully recovered from my last lengthy hospitalization back in Oct. My breathing just didn’t feel right. Usually after a bad flare or hospitalization, Im mostly recovered and back to my baseline within a few weeks, a month tops, but that didn’t happen this time around. For some reason my breathing never really settled down completely. I felt weak all the time and couldn’t get my stamina back up. Then about two weeks ago I noticed something different about my breathing. I noticed that when I exerted myself, even slightly, or took a deep breath in, that it was noisy and stridor sounding, not like a regular asthma wheeze, more of a restriction. Usually with asthma it’s difficult to exhale, but now it was also difficult to inhale. As the days went by it became increasing more difficult to pull air in without added effort. Also, my voice would cut out when I would talk. I felt like my upper airway was obstructed somehow, but I couldn’t pinpoint exactly where it was coming from or what was causing it. Finally it bothered me enough that I texted my pulmonologist asking him if he could move my appt with him up to this coming week so that he check my symptoms out. A few days later in his office, still having inspiratory stridor and now my asthma acting up, he thought I might be having some vocal cord issues , which can sometimes happen with severe asthma. So he sent me across the hall for quick spirometry to check out my flow volume loop. This can sometimes show patterns that are common for VCD ( vocal cord dysfunction). Nothing really stood out on the spirometry loop, so just to be safe he ordered some stat CT scans of my neck and lungs. Fortunately, we were able to get a same day CT appt over at the Mt Zion a couple miles away. The CT scans took all but 10 minutes and thinking that it would take a day or two to get the results, we headed back home. Then just just as we’re about to exit off the freeway, I get call from my lung doc. Nothing more nerve racking then receiving a call from your doctor when your driving. He said not to worry, but the radiologist who read your scan was very alarmed by what he saw and that I needed to head back to the hospital as soon where an ENT doctor (Ears, Nose and Throat specialist) would meet me in the ER to talk with me about what they found. ….oh, and not to eat anything . Well after a quick shower and changing of cloths, we head back to city. And in true bay area style took us 2 hours to drive the 30 mile distance to the hospital. Poor Douglas, he was so tired of driving back and forth all day. We made it to the UCFS ER at 8 pm. They were obviously expecting me, because when I went to register in the ER something popped up on the computer screen and the triage nurse took me right into a room. 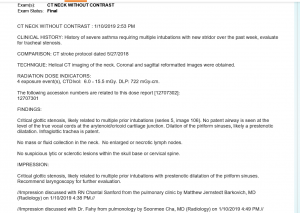 A few minutes later one of the ER docs came in and said, you have severe glottic stenosis that blocking your airway and because of your history of severe asthma and the frequent need for intubation, we think its wise for you to get a tracheostomy now before your asthma gets out of control. The fear being that because my airway was so narrow they would not be able to get an endotracheal tube in if I crashed with my asthma. WFT?? If you put a trach me how long do I have to keep it in? They said, well it might be permanent, or at least until they find a way to repair the stenosis. Wow, talk about that sinking feeling. It felt like I was being handed out an ultimatum of life with a tracheostomy or possible death if I refused. A few minutes later one of the ENT docs stopped by and told me what they found on the CT scans and that she would like to take a quick look at my airway and cords, which she did with a small fiber optic scope that she inserted through my nose. She had me do a series of quick sniff and E sound, and swallowing. Within a minute she was done and news wasn’t good. The stenosis was worse then they thought. and one of my vocal seemed to be tethered to some scar tissue from underneath. The only way to fix this was by dilation surgery, which sometimes requires tracheostomy before the procedure can be done. Again I asked, if I need a trach will it be permanent? The response again was, we don’t know. She said that because my asthma was also acting up that they would admit me to the ICU for observation overnight and would consult and brainstorm with her collogues to see what they could come up with. If my asthma got really bad overnight and required intubation, they would first try to do it with small pediatric endotracheal tube, though it would have to be inserted through my nose and without knocking me out. If that didn’t work they would have to do an emergency tracheostomy. Needless to say, I had a very sleepless night. Ah, but how fast things can change. The following morning Dr Russell and his team arrived at my bedside and unveiled there plan of action. Describing in great detail with illustrations and an actual video of my airway, of what was going on with vocal cords and glottis, and knowing my feelings about tracheostomy, they told be about an a brand new technique called Teardrop-shaped glottis dilation that one of their Otolaryngology docs had just developed. Because the type of stenosis I had was in the early stages, that I would probably be a good candidate. Not only that, but that I would be one of only a handful of people to ever have the procedure done using this new technique. But the most miraculous part for me, is that if it worked I probably wouldn’t need a tracheostomy. Well, of course I said…. Lets do it! Next is the most amazing and probably the best example of teamwork and communication I’ve ever witnessed in a medical setting. When I asked when’s the soonest we could do this, the head surgeon said, we’re a little worried about your current asthma status ( I was on continuous nebs at the time), but we’ll call your pulmo and if he thinks you’re stable enough, we can do the surgery today, how’s that? I swear, within 3 hours of that conversation I was in the OR and the surgery was finished. 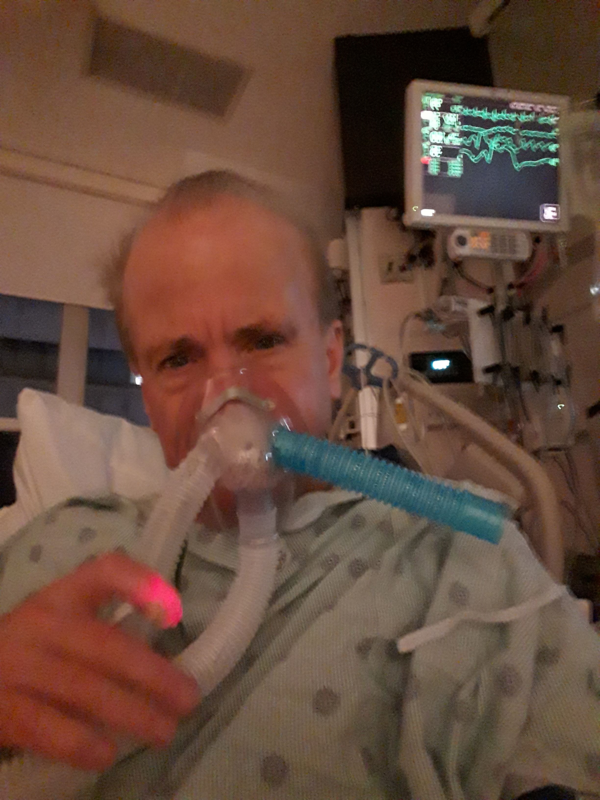 After a short recovery period and (a brief episode of psychosis which always happens to me when I’m steroids and anesthetics at the time), I was back in my ICU bed breathing deeply and effortlessly again. I cant tell you how good it felt. The fact that they were able to pull off this procedure without a hitch is absolutely stunning to me. Even more amazing, is how they can do this procedure in such tight quarters, all while under general anesthesia and done entirely through the mouth. Then again, UCSF has a lot of very smart and innovative people working for them , so I guess its not that surprising. The particular procedure they performed on me ( posterior sub glottic dilation using the teardrop method) has only been a handful of times. Lucky for me I was at the right place at the right time. Had I waited much longer to get this problem checked out, I might have a hole in my neck or not be around at all. 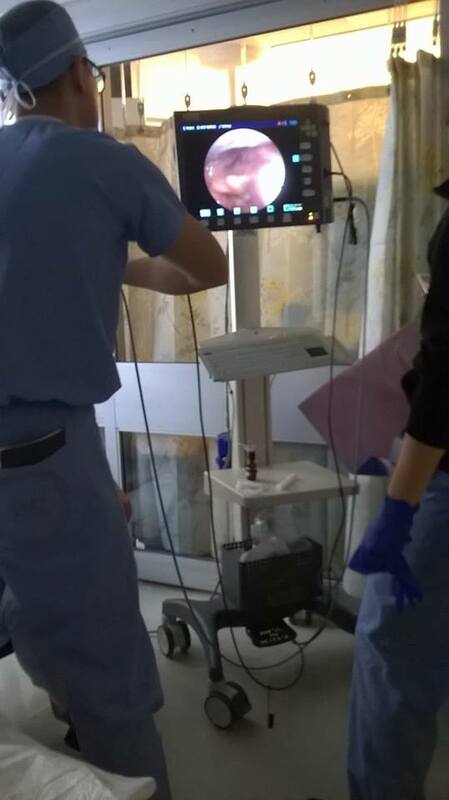 They found that a large portion of my airway was totally occluded. The opening though my vocal cords was literally the size of a straw. 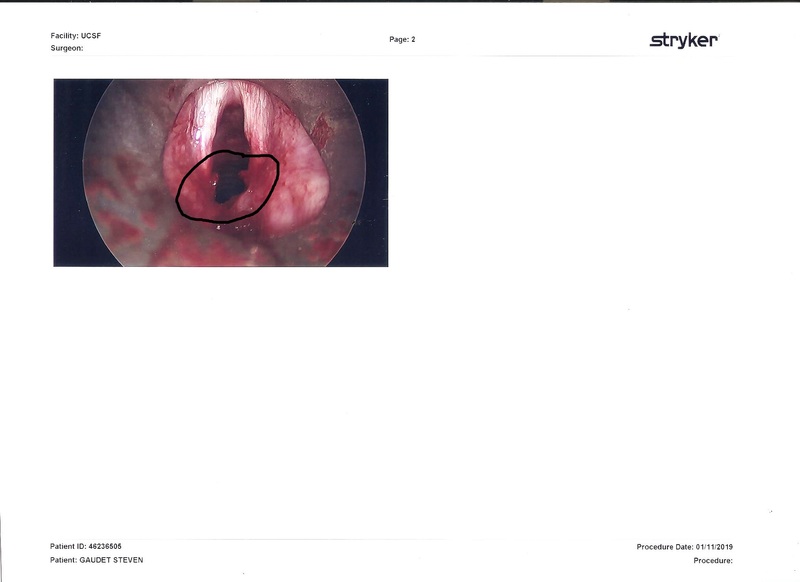 [Trigger warning :] Here are some photos of my beautiful glottis and vocal cords for your enjoyment. In the first set you can see some of the scar tissue in the circled areas and how it prevented my cords from opening all the way. The tube you see going through my vocal cords is a jet ventilator which shoots out small, but very rapid breaths into my lungs, just enough to keep them ventilated. This is how they can work in the area without having a breathing tube in place. They also use a type of balloon to dilate the area and give them room to work. 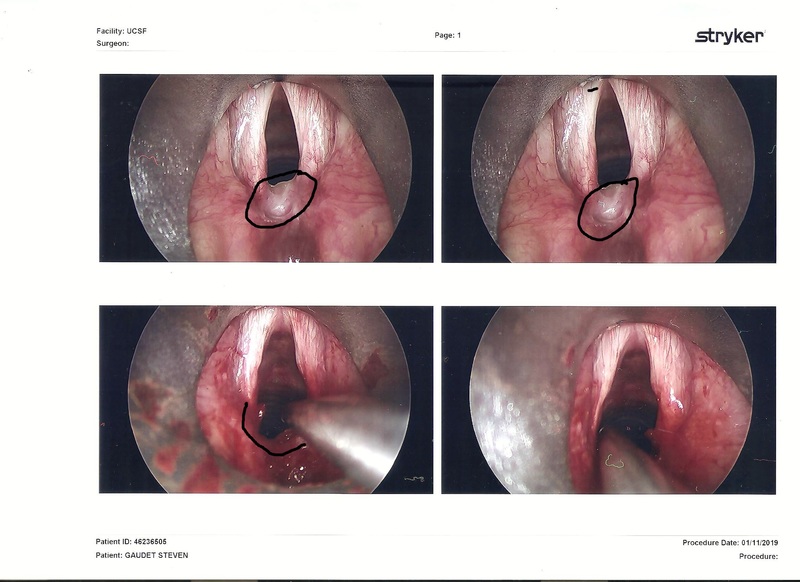 In the second photo you can see where they removed the scarred area and dilated my cords open again. They then injected steriods directly into the tissue to prevent more swelling and inflammation. Finally, a picture of me breathing in normal again after the surgery. It’s now my first day out of the hospital and second day since the surgery, and other than a mild sore throat and achy tongue and mouth, Im doing great. My asthma is not back to baseline yet, but at least I can inhale easily now. Going forward I have to be rescoped every few months to make sure there is no more scar tissue developing, which usually happens. But Im cool with that, I just don’t want a tracheostomy. The tricky thing about having tracheal stenosis, whether you have asthma or not, is that the symptoms can mimic asthma. In fact, some people who seek medical care for noisy and/or labored breathing are sometimes misdiagnosed with asthma, when they might actually have a tracheal stenosis of some kind. The same thing happens a lot with people who have vocal cord dysfunction (VCD). Though not the same thing as tracheal stenosis, they too are often misdiagnosed as having asthma and are prescribed asthma medications, which of course don’t work. This type of confusion only delays getting a correct diagnosis and effective treatment. My advise for those who have asthma and have been intubated for it, and then within a few weeks or as long as a year down the road suddenly find it difficult to INHALE when they exert themselves or they start to loose their voice, is to get checked out by an ENT doctor. There’s a variety of simple tests they can do to see what’s happening deep down in your throat and determine whether your symptoms are due to asthma, VCD, a tracheal stenosis, or something else. I’m having trouble with my asthma. I thought I was going to die. So its amazing to read you survive worse asthma than me. You’re an inspiration. If you’re not used it, or even if you are, a severe asthma flare can be quite scary because you’re never quite sure how bad it might get. Fortunately, while you can get quite ill, very few people actually die from an asthma exacerbation. If you don’t already, make sure you have a plan in place in case your asthma gets out of control.